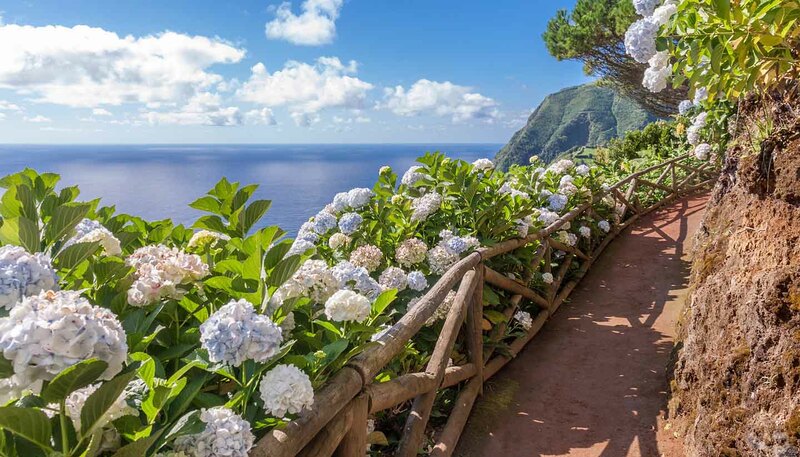 The Azores benefit from a temperate, maritime climate with mild winters (average daytime temperatures range from 12-15ºC/54-59ºF) and warm summers. Humidity is reasonably high and the wettest months are October to March. Mid-season clothes are best; the temperatures are mild at all times of the year. The Azores are a widely separated group of nine islands in the Atlantic, due west of mainland Portugal. The islands are Corvo, Faial, Flores, Graciosa, Pico, Santa Maria, São Jorge, São Miguel and Terceira. The islands are mountainous in the interior and forested, leading down to long beaches and fishing harbours. There are several hot springs and spas.